Performers with the Imaginary Theatre Company of the Repertory Theatre of St. Louis will bring Aesop's fable "The Tortoise and the Hare" to life Feb. 5 at the West Plains Civic Center theater. Call 417-255-7966 for more information. Performing a scene from the play are, from left, Charlie Barron, Lana Dvorak, Delaney Marie Piggins, Myke Andrews. Photo courtesy Jill Ritter. Performers with The Imaginary Theatre Company of the Repertory Theatre of St. Louis will bring Aesop’s beloved fable “The Tortoise and the Hare” to life Feb. 5 at the West Plains Civic Center. The performance is being presented by the Missouri State University-West Plains University/Community Programs (U/CP) Department and the West Plains Council on the Arts. Partial funding has been provided by the Missouri Arts Council, a state agency. 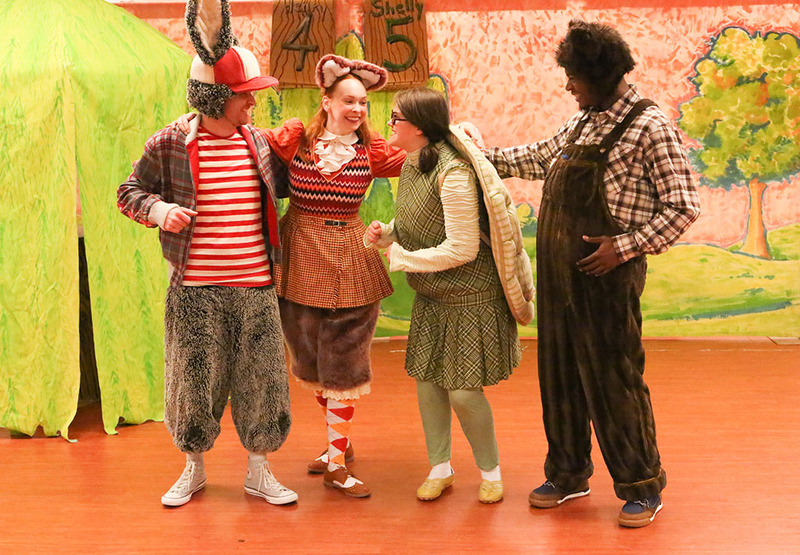 In a lively musical adaptation, the 50-minute play explores Aesop’s fables, creative problem solving, and themes of selfishness, growth and change, according to organizers. This much-loved fable tells the story of Henry, a racer and one of the fastest bunnies the forest has ever seen, and his quietly devoted best friend Shelly, a tortoise. Henry has always been the star of the show until one day Shelly starts to have some dreams of her own. With the help of her forest friends, Shelly realizes her own worth, and Henry finds out that sometimes being the best isn’t the most important thing. There will be two daytime performances for area students free of charge and an evening performance at 7 p.m. for the community, organizers said. The evening performance will be in a sensory-friendly format, they add. “If you know a child who lives with sensory sensitivity, this is the perfect way to introduce the child to the theater,” said arts council president Paula Speraneo. Admission for the evening performance is $5 per person for adults. Children age 13 and under and students with a BearPass ID will be admitted free. Those who would like to attend the daytime performances with their students should contact info@westplainsarts.org or call 417-255-7966 to reserve their seats.